Pulled pork is a slow cooker classic, and is great to make for a crowd, or to make extra and freeze it for later. This version has a mix of spices that kick up the flavour so much, it tasted great even before the barbecue sauce was added. For this, I used a 1.5kg boneless blade pork roast (pork shoulder), which was perfectly cooked in 6 hours on the low setting. You might not use all of the spice mix, this mixture should make enough to cover the outside of the pork. Remove strings from pork with scissors and place pork into slow cooker pot. Sprinkle spice mixture over pork and spread evenly with the back of a spoon. Flip pork over and add spices to other side. Add water to slow cooker pot and set to low. Cook for 6 hours (cooking time will have to be adjusted for weight). When 6 hours is complete, remove the pork from the slow cooker (using slatted spoons--pork will be very hot) and place on a large cutting board. Use slatted spoon to remove fat pieces from water remaining in bottom of pot and discard. Use a fork to remove fat pieces still attached to pork, and discard. 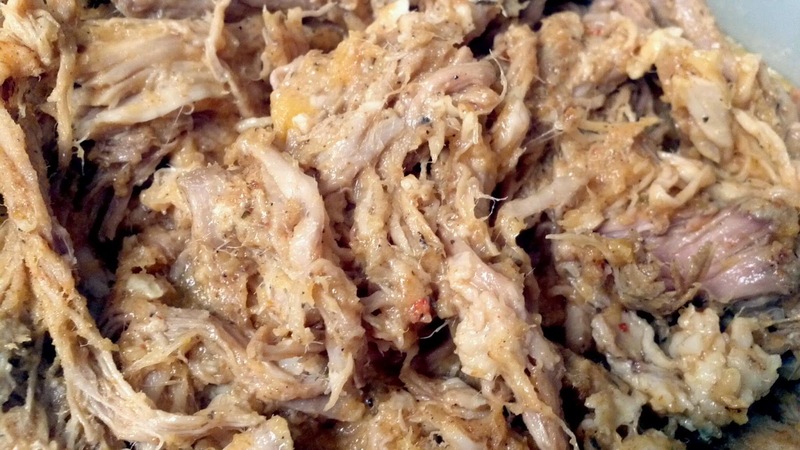 Put pork back into slow cooker pot and shred with forks. Add barbecue sauce as desired (1/2 cup approximately). Serve pork on a bun.